Fall is here! So many people skip the fall fun and jump into the Christmas season. But Fall is one of my favorite times of year and I love to savor it. 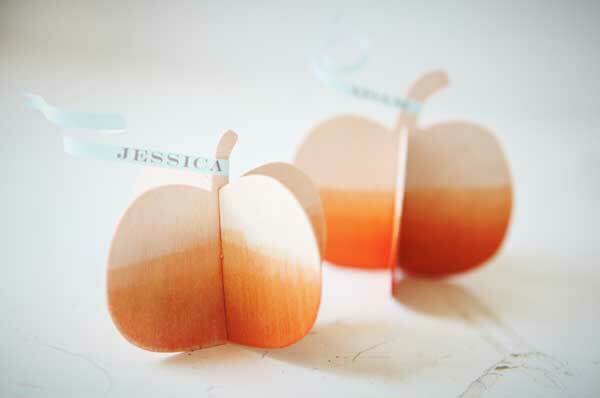 To make guests feel right at home at your fall party how about making custom place card holders that double as a take home gifts? These little pumpkins are quick and easy to make and your can really experiment with the DIY process to make these all yours. You can even upsize the design to make a great centerpiece! Step 1. 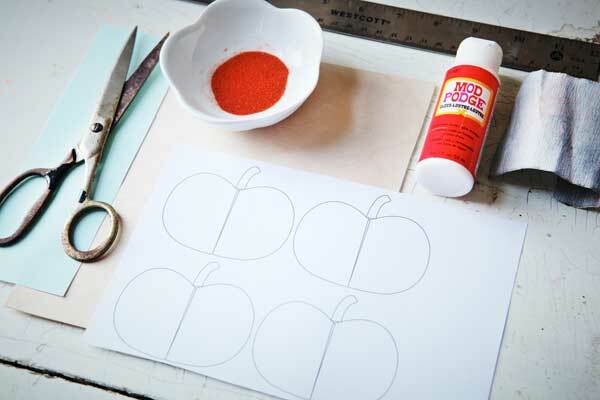 Draw pumpkin shapes onto paper. 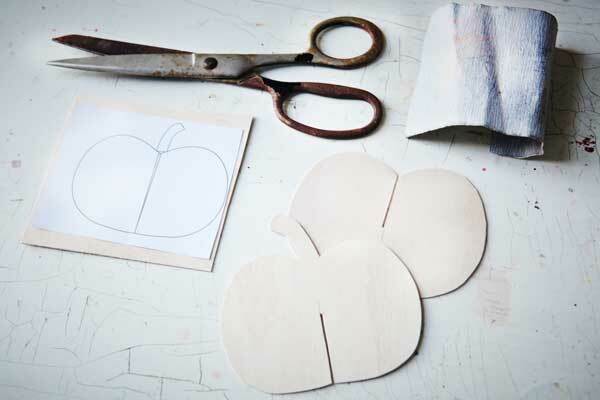 Cut out using scissors and use sandpaper to clean edges. Step 2. Draw lines onto the center of each pumpkin piece. Draw from the bottom on the stemmed piece and from the top on the unstemmed piece. Then cut a thin slit the same thickness as your wood. Step 3. Slip your pumpkins parts into one another and dip dye each pumpkin using a RIT dye bath. To achieve a gradual fad hold your pumpkins at several levels in the bath starting with a short dunk half way up your pumpkin then longer towards the bottom. 4. 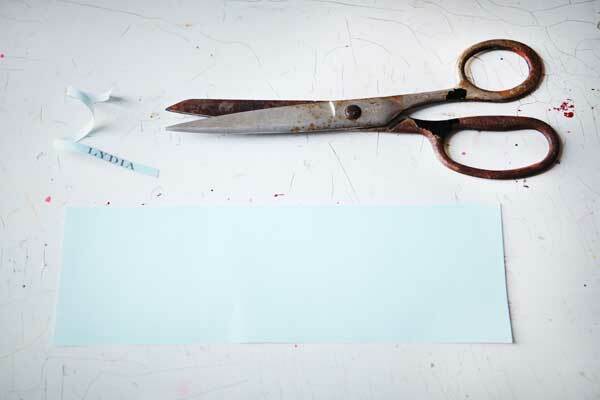 Type or scribe the names of your guests on paper and cut 1/8″ strips. To curl paper lightly pinch between two fingers and quickly pull. Cut a “v” shape at the end of your curl and then glue onto your pumpkin stem. –Happy Fall! oooo, how pretty! I may just try this out! thank you! Oh boy! These are super adorable. I can’t wait to try my hand at some of these. Really cute idea, but omg if you cut yourself on those scissors you are going to get tetanus! What a cute idea! Saved it for the next year’s Fall holidays. Quick question: where do you buy those thin sheets of craft wood? I think they are cute and I am doing them in a orange foil. These are perfect for Thanksgiving! If only Canadian Thanksgiving wasn’t already over. Thanks for all of the great tips. More uses for all those packs of balsa wood I have! Sweet! This is really sweet! If only we had Thanksgiving in the UK! what a lovely old scissors!!!!! Such a lovely project, with such lovely images, done by such a lovely lady! How CUTE! 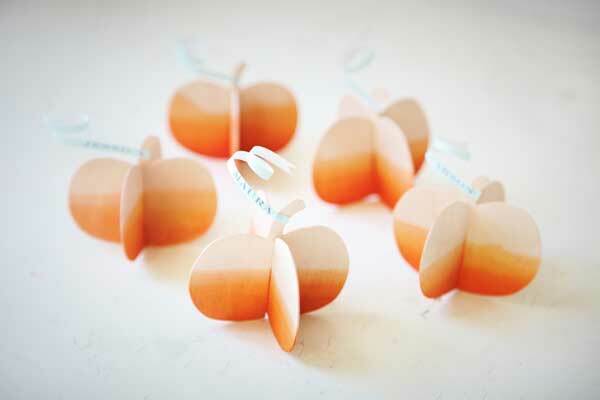 I think I need to make these for our Thanksgiving place settings! I love this project! Now if only I can just find time to make these between diaper changes, grocery shopping, and kid wrangling. I may not be able to pull it off with the wood this year, but I bet stiff paper would be a decent alternative.